what is the best meat tenderizer? If you are looking for the best meat tenderizer that gets the job done in a short amount of time without a lot of hassle, then we suggest the Jaccard Supertendermatic 48-Blade Tenderizer. The Jaccard tenderizer reduces your cook time by as much as 40 percent and reduces shrinkage of your meat, which allows it to cook evenly. The razor-like blades help cut through connective tissue, making meat more tender and easier to digest. The price of this hand-held meat tenderizer doesn’t empty your wallet and it will last many years with proper care. 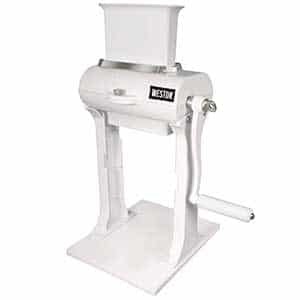 The Jaccard Supertendermatic 48-Blade tenderizer can make all types of meat, including turkey, veal, chicken, beef, venison, pork, and other types of meat tender. 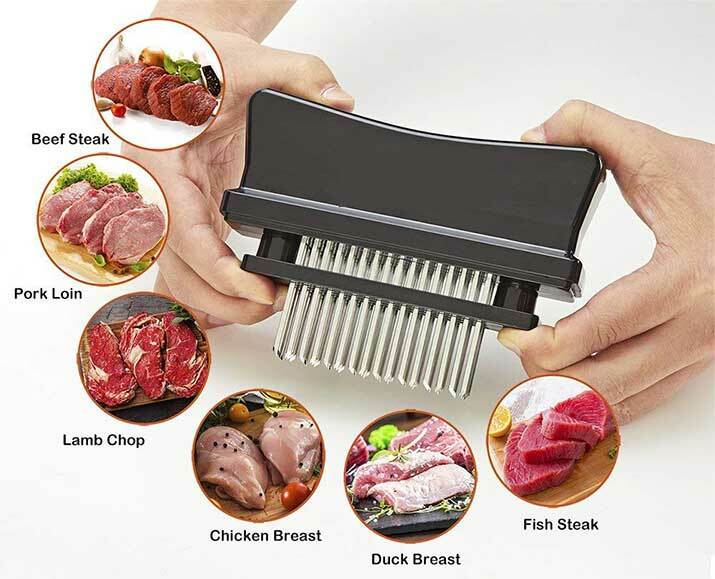 Whether you decide to shop online or in-store for your perfect meat tenderizer, you need to consider a variety of options and factors. The least expensive meat tenderizer is not always the better option. The last thing you want is buyer’s remorse and a lot of tough meat. The least expensive meat tenderizer may not always the better option, but the most expensive one does not guarantee satisfaction either. Considering the specifics that you have in mind, it’s always best to read the labels and find out what each tenderizer offers. You don’t want to purchase more features than you need or lack the ones that you do. The weight of a meat tenderizer matters because it determines how easy it is for the blades to penetrate the meat and how quickly the job is done. You also need to make sure that you are comfortable when you’re holding the tenderizer to prevent injuries. It should not be too light or too heavy. The best tenderizer for you will not wear you out or cause you to strain to use it. The features of any meat tenderizer will not vary much. The job of this tool is to make meat tender so it is easy to chew and digest. Look for a tenderizer that is dishwasher safe. Tenderizers that are dishwasher safe save time and promote better health. You don’t have to worry about removing meat or sterilizing the tenderizer. Putting a dishwasher on a deep clean setting does everything you need it to do to be ready to use again. Check the blades of the tenderizer before you purchase it. Blades that are too sharp shred meat and can cause serious injuries. Choose a tenderizer that has short blades to prevent meat from spoiling while you’re preparing it. Whether you choose an electric tenderizer or one that is manual, stainless steel blades are best because they last longer. The material you choose depends on the meat you intend to tenderize. A tenderizing tool can be made of wood, metal, marble, plastic or rubber. Depending on the meat, tenderizers made of wood can stain easily. Plastic tenderizing tools can break easily if they are made with sub-par materials. The material that is used to make a tenderizer determines its longevity. The handle of a tenderizing tool, such as a meat tenderizer hammer, is important because it determines how well you are able to use the tool. A good grip means you can grip the tool properly and get the desired results. If you’re concerned about the tenderizer slipping from your hands, a rubber grip is best. The design you choose is a matter of personal preference. Some tenderizers have square heads while others have round ones. The design does not determine how well the product works. There are a variety of meat tenderizers available that come in different shapes and sizes. The size of the head determines how long it takes to tenderize the meat to your liking. Considering the head of the tenderizer helps you work smarter, not harder. The correct head size penetrates meat quicker and more thoroughly than if you use a tenderizer that has a head that is too large or too small. To find the best meat tenderizers on the market, we compared the ratings and reviews of many products from the buyers and the experts. From the data we gathered, we narrowed our list down to these 7 meat tenderizers. What You Will Love: We love this Jaccard meat tenderizer because it is not physically demanding like other tenderizers and it does not pose any dangers to overworking the meat. This tenderizer also doesn’t cause a substantial amount of meat shrinkage as with other meat tenderizers. 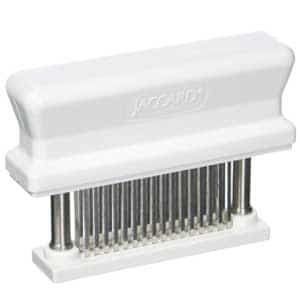 The Jaccard Supertendermatic 48-Blade Tenderizer is available with 45 or 48 blades that easily pierce the meat. These stainless steel blades are great to use with a variety of meat, including beef, lamb, pork, chicken, and more. The good news is that it’s easy to use, making it the ideal tenderizer for everyone to have in their kitchen. You use the Jaccard Supertendermatic like a rubber stamp. You press the top of the tenderizer and the blades easily penetrate the meat, cutting your prep time in half. This meat tenderizer has removable parts, including the cartridge which makes it easy to clean. These removable parts are dishwasher safe. Since the cartridge is removable, replacing it, if the time ever comes, is simple and effortless. There are two different Jaccard Supertendermatic 48-Blade tenderizers. One model is black, and the other is white. The only difference between the two is the way they are disassembled. The black models do not require tools for full disassembly, but the white models require a screwdriver. The 48-Blade tenderizer is less expensive as compared to other tenderizers, which makes it a handy kitchen tool to have that’s well worth the money. Pros: This meat tenderizer allows marinades, brines, and spice rubs to thoroughly penetrate the meat. The spices are not stuck solely on the surface of the meat and the flavor is enhanced by tenderizing the spices throughout the meat. Cooking time is reduced by as much as 40 percent. Cons: This meat tenderizer does not make meat flat, making certain dishes, such as chicken-fried steak, difficult to make. What You Will Love: We chose the KLEMOO meat tenderizer tool as the best value tenderizer because of its abundance of features and reasonable price. The KLEMOO meat tenderizer offers many safety and replacement features. This meat tenderizer has a lot to offer for the least amount of money. 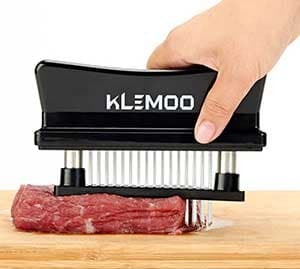 The KLEMOO meat tenderizer offers 48 razor-sharp, needle-like blades that can tenderize many types of meat, including chicken, pork, beef, and more, which makes it a must-have tool in your kitchen. You can see the difference in the texture and taste the difference in the tenderness of the meat as compared to your current method of texturing. The KLEMOO tenderizer tool uses tiny heat channels that go inside the meat and disintegrate the connective tissues, producing a much more enjoyable dining experience, as well as a more comfortable digestion period. After this tool is used for a maximum of 5 minutes, the spices, marinades, and other seasonings are absorbed, making the meat savory and evenly seasoned throughout. Although the heat channels of the KLEMOO meat tenderizer tool are small, they can penetrate the toughest cuts of meat, making the meat a tender delicacy that may have saved you a little money. This meat softener speeds up your cooking time by at least 40 percent, which means your food is evenly and thoroughly cooked in almost half the time, which also helps reduce the common issue of meat shrinkage. Less meat shrinkage means a more ideal portion size, and that’s awesome! For these reasons, we find the KLEMOO needle tenderizer stunning. It is equipped with an impressive functional design that allows you to avoid hand cramping thanks to the non-slip handle. Another great perk of using the KLEMOO meat tenderizer is that you don’t have to exert a lot of force to get the desired results. All it takes is a press, and the tiny, sharp blades will do the rest. Pros: The KLEMOO tenderizer is affordable and of high-quality. It brings out the flavors of the meat without sacrificing texture, shape, or features for the price. This tenderizer also helps minimize the time you spend cooking, and time is not free. Cons: The KLEMOO tenderizer is great for many things, except thick cuts of meat. The blades are sharp, but they are too short to penetrate meat from top to bottom. What You Will Love: The best meat tenderizer mallet tool is ideal if you’re looking for a tenderizer with a non-slip grip. We love this tool because it has a variety of uses and purposes, including making meat the perfect texture and size for a variety of meals. The non-slip grip almost makes it perfect. 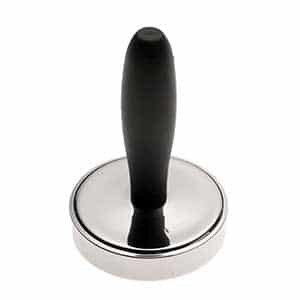 If you’re looking for a meat softener that doesn’t disintegrate meat fibers but enhances it with flavors, the meat tenderizer mallet tool is ideal for all of your cooking projects. If you want steak that melts in your mouth, this meat tenderizer mallet tool was made with you in mind. 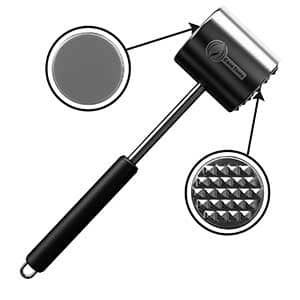 This meat tenderizer hammer works wonders with chicken, pork, beef, venison, and more. Tough meats are no competition for this mallet, which makes it a favorite of many chefs. Country fried steak and cordon bleu are just a couple of succulent meals that you can look forward to making with this meat softener. If you’re concerned about washing it, don’t be. This meat tenderizer tool is dishwasher safe thanks to its sturdy stainless steel head and soft, rubbery, silicone handle. Being dishwasher safe means you can thoroughly sanitize this mallet and have peace of mind because you don’t have to worry about bacteria and other harmful pathogens. What’s better than one? Two! This meat tenderizer mallet tool has two sides, one for flattening meat and another for tenderizing meat. If you’re looking to get inspired in the kitchen, this meat tenderizer hammer comes with a step-by-step guidebook full of recipes! In addition to the recipe book, there are video tutorials you can reference to help you mix up your meal menu and try new things. Pros: This meat tenderizer mallet tool is versatile and multifunctional, which makes it a desired, favorable item in a kitchen. Besides the non-slip silicone grip that helps to prevent serious injuries, this mallet tool is easy to use and to store. Cons: The only issue we have with this meat tenderizer mallet tool is the price. It is a little more expensive than other products that are available on the market. What You Will Love: We like the Western Manual Heavy Duty Meat Cuber Tenderizer because it is awesome for mass production, such as for a restaurant or for preparing for a large family gathering. It has over 20 stainless steel blades that help make your meat the perfect texture and size every time. The Western Manual Heavy Duty Meat Cuber Tenderizer is the ideal tool to use for making cubed steak and chicken fried steak. If you’re preparing for a large family gathering, this meat tenderizer is the ideal tool to use, especially if you have a little help to form a short assembly line. Because of its durable metal design and stainless steel teeth, mass production is a breeze because you don’t have to worry about the machine jamming. If you like to hunt or are a food guru, you will do well with this meat tenderizer tool in your kitchen. Are you preparing a large holiday meal? This heavy duty meat softener is on your team and will help make things happen. This meat tenderizer machine can tenderize pounds of meat at a time. Just by turning the crank handle you can prepare a large amount of meat in a short amount of time. Although the Western Manual Heavy Duty Meat Cuber Tenderizer can tenderize large masses of meat, it is still small enough to easily store. More is sometimes better, and this meat tenderizer tool comes equipped with one pair of shiny, stainless steel tongs. These tongs help you place meat in the tenderizer without using your hands, which prevents serious injuries. Tenderizing your meats are the primary way to reduce cooking time, and this device gets the job done. This tenderizer helps you to get the most from the seasonings and marinades that you use by allowing you to evenly distribute them throughout the meat. If you’re worried about chemicals from the machine entering your food, the manufacturers coated the devices in food-safe coating. Pros: The Western Manual Heavy Duty Meat Cuber Tenderizer features a compact design that allows for easy and effortless storage. The parts of this tenderizer are dishwasher safe, and the finish on it is food-safe and will not mix in with food. Cons: In order to clean this meat tenderizer, it needs to be taken apart and placed in a dishwasher. It is also much more expensive than other meat tenderizers on the market. What You Will Love: We chose the Mr. Bar-B-Q Professional Meat Tenderizer because it meets the sanitation standards of ETL, and it is dishwasher safe. If you’re in a hurry, the Mr. Bar-B-Q Professional Meat Tenderizer will tenderize your meat quickly, which lets you get back to other important matters. The Mr. Bar-B-Q Professional Meat Tenderizer provides a firm grip handle that prevents injuries, as well as, provides a slip-proof grip for fast and thorough tenderizing. With over 40 razor-sharp penetrating stainless steel blades, the meat releases natural flavors which help give the meat wonderful taste. This meat tenderizer features a professional design that offers a solution for the toughest cut of meat, making it ideal for cooks and chefs of all experience levels. The good news is that using this meat tenderizer tool is effortless. Although it’s only available in red, it’s a lightweight solution to tenderizing your meat without a lot of hassle. There are no harmful materials used in making this tenderizing device, so you don’t have to worry about chemicals and other harmful materials in or around your food. A dishwasher-safe meat tenderizer is a happy one and so are the users of the device. This professional meat tenderizer can tenderize any type of meat with ease and perfection, but constant use of it will cause it to have to be replaced every two years or sooner, depending on how much you use it. If you need a meat tenderizer for occasional or periodic use, the Mr. Bar-B-Q Professional Meat Tenderizer will be happy in your kitchen. Pros: This tenderizer does not need to be assembled or disassembled for proper use or to get your desired results. This meat softener is easy to use and gives you near perfect results in a short period of time. Cons: When compared to other hand-held meat tenderizers, the Mr. Bar-B-Q Professional Meat Tenderizer is more expensive than others and only lasts a short period of time if it is frequently used. What You Will Love: We chose the Norpro Grip-EZ Stainless Steel Meat Pounder because it’s small but powerful. If you’re looking for a smaller addition to your kitchen family, the Norpro Grip-EZ Stainless Steel Meat Pounder was made with you in mind. It doesn’t take a bulky machine to tenderize meat. If you’re looking for a meat softener that will not tear or shred your meat, the Norpro Grip-EZ Stainless Steel Meat Pounder is what you’re looking for. Due to its large, circular base, and short stature, your meat can achieve a uniform thickness, which promotes even cooking of your meat. Although this meat pounder has an appearance like nothing you may have ever seen in anyone’s kitchen, it transfers kinetic energy, which you need to effectively pound for more even distribution when you are beating meat. This meat tenderizer is easy to use and is more effective than many of the products that are similar. If you’re inclined to beat the meat flat, the Norpro Grip-EZ Stainless Steel Meat Pounder will help you achieve that goal. This meat tenderizer features stainless steel material, which makes it easy to clean and sanitize, as opposed to other popular finishes, such as aluminum. Thanks to the stainless steel finish, this meat tenderizer tool lasts longer and you don’t have to worry about rusting. There is a rubber handle that prevents slipping, which in turn, prevents injuries. You can shape the meat while you are pounding it, which is amazing! It is great for home cooks, chefs, and anyone who wishes to use it. Ideally, you will not get stressed out while using this tenderizer, and you will not have to wait for the desired results. Pros: This tenderizer is lightweight, yet can handle heavy-duty jobs, it’s easy to hold, and it helps to shape meat. Cons: This tenderizer is great for only small pieces of meat, which limits your choices. 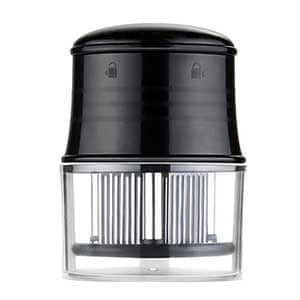 What You Will Love: We chose the Koncle Professional Needle Meat Tenderizer because it features stainless steel blades and other high-quality materials that are durable. It is safe to clean in any dishwasher and fits almost anywhere. It makes for a cute and space-saving addition to your kitchen family. Are you considering entering a food challenge or cooking contest? If so, this best meat tenderizer is waiting for you. The Koncle Professional Needle Meat Tenderizer tenderizes meat quickly and evenly, leaving you with a piece of meat that is full of natural, flavorful juices. Not only is it easy to use, it’s fun! All cuts of meat will be tender and will hold all of the flavors you add, even if you’re working with a tough cut of meat. The Koncle Professional Needle Meat Tenderizer is made from durable materials that allow you to tear through meat the way you see fit to get through the tough connective tissues and the meat fiber, making it tender and juicy. 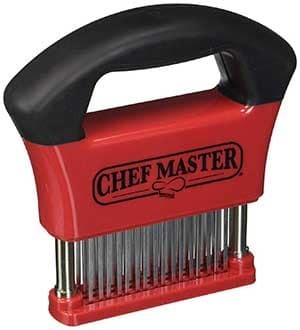 This meat tenderizer has over 45 blades that are ultra-sharp and allow you to create a flavorful, tender work of art. Regardless of your chef status or cooking experience, this meat tenderizer tool can help because it is designed to help everyone. Perhaps you are aspiring to be the world’s greatest chef or just brushing up on your skills. Due to the razor-sharp blades, this tenderizer penetrates meat with ease, which promotes flavor throughout instead of flavor resting on the surface of the meat. Pros: The Koncle Professional Needle Meat Tenderizer is easy to use and safe. It is easy to clean and store without any hassles. You can store it almost anywhere. There is a built-in safety lock that helps prevents injuries. Cons: If this device is not handled with care, severe injuries can occur. The blades can become stuck inside the chamber, which can be difficult and dangerous to fix.